This started as a look at the drives that came with the IBM5160 I recently acquired and took apart in Part 1. However, when I started looking at when should have been fitted, I ended up with so many different types of drives on the bench at one time, it seems to have grown into a brief history of the disk drive. The original IBM PC (the 5150) had two of these. They are Tandon TM100-2A drives, 5.25" floppy disks 40 tracks, DS DD (Double Sided, Double Density), giving a total of 360KBytes per disk. For reference, that's about the same size as each of the photos on this page. These are 'full height' drives, equivalent to two of today's standard 'half height' drives (i.e. it's the same size as two DVD-ROM drives). The IBM 5160 that I'm rebuilding would have originally be fitted with one of these and one full height hard drive. When I got it, both had been replaced with 4 half height drives, 2 hard drives (on the left) and 2 floppy drives on the right. The replacement drives were (at least) half the size, but they were twice the capacity, as is the way of these things. 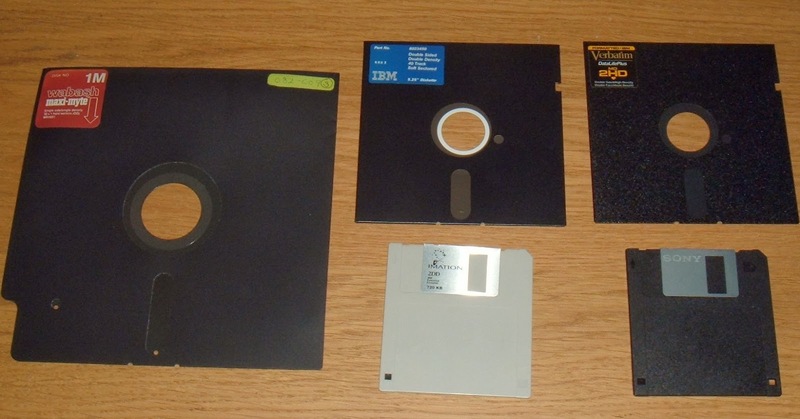 I don't have any 8" disk drives, but the disk on the left is an 8 inch floppy, with a capacity of 1Megabyte. The disk with the blue IBM label is a DS DD 360K. Next to that is a progression, same size but 4 times the capacity, a DS HD (Double Sided, High Densitry) 1.2MB 5.25" floppy disk. Below are the 3.5" inch disks that superceeded them. Firstly the grey disk is DS DD and gives 720K, and finally the largest capacity is the 3.5" DS HD floppy at 1.44MB. On the 3.5" disks, an extra hole was added on the right to indicate high density. The one of the left and the slot on the right on the 5.25" disks being a write protect mechanism. The drives have shrunk as well. The 1.2MB drive is 'half height', and the 3.5" drives are even smaller. The 5160 cannot support the two HD formats, so that makes it easier to chose what to put back in. I suspect I will go with the 360K DS DD 5.25" drive and one of the 720K DS DD 3.5" drives that came with it. That would leave space for one hard drive. 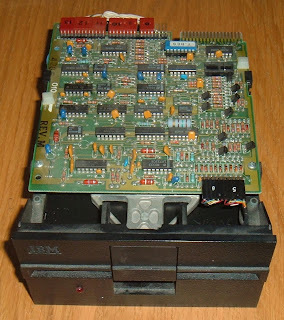 Not relevant to the 5160, but there was another drive size on the market at the time, Amstrad had a 3" disk, the CF2. This had a capacity of 360K in total, split into two 180K sides, so it needed to be turned over to get to the other side. This made it cheaper as it only needed one read/write head rather than two as fitted to all the double sided drives. 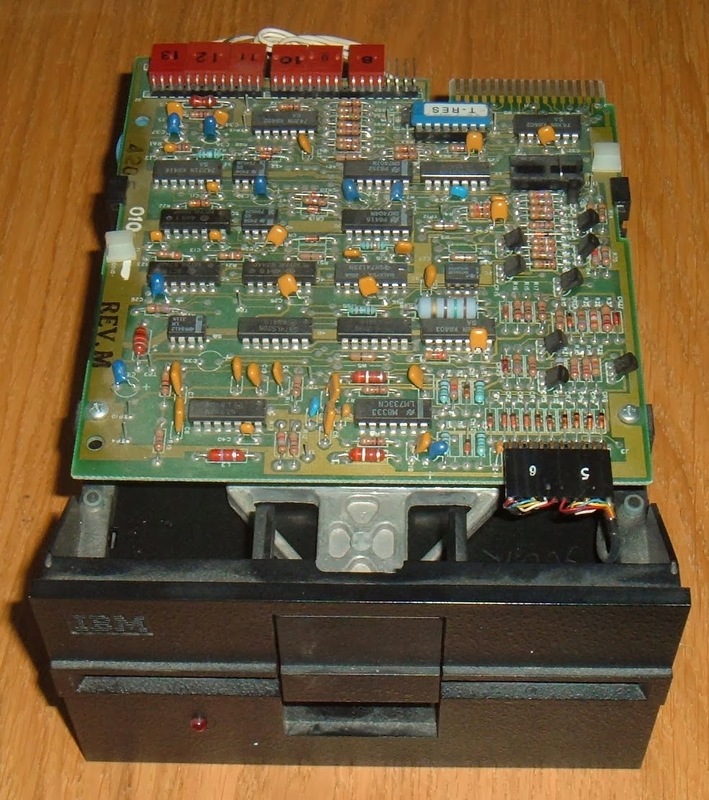 Amstrad used these 3" drives on their CPC 6128 and various word processors such as the PCW 8256. 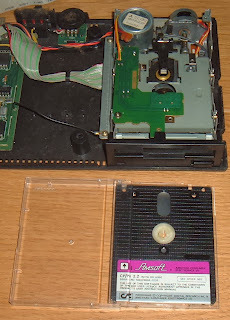 These were also used in the Specturm +3 (which was build by Amstrad). They later relented and moved to 3.5" DS DD. With hard drives again, capacity grows and size is reduced. The drive on the left is a full height 5.25" hard drive, an ST4038, with a capacity of 30MB. Tiny by today's standards, but that's 100 floppies worth.This is the soft of thing which would originally graced the 5160. The next two are the ones that were in the 5160 when I got it. The first is 5.25" half height, an NEC D5126 at 20MB, and a half height 3.5" wide drive in a frame to fit half height 5.25", a Tandon TM262, also 20MB. For comparison, the ones at the end are modern standard 3.5" and 2.5" hard drives, both 160GB (yes, 8000 times larger capacity). And the little spec at the front is a 4GB micro SD card. Here is the platter from a 5.25" hard drive I took apart when it died in the early nineties. It was obsolete then at around 5MB I think. Next to it is the disk removed from a 5,25" floppy (probably around the same time). The small pin hole on the left is used to indicate where track 0 is, a light shines though a hole in the cover and when it is lined up with the hole, it shines on a sensor and the drive knows it's at the right position. That's what generally happens when you insert a disk, it spins it around until it detects track 0. Next to that is a 3.5" drive with the cover removed. There you can see the disk itself and the head which floats over it. On the end is a 2.5" laptop drive. I'd like to go back to one full height floppy and one full height hard drive, but the full height hard drive I have doesn't have a front panel. So I'm going for one full height floppy, as it would have had when new, and a half height floppy and half height hard drive, both of which were in it when I got it. I've tested the floppy drives and all seem to work. The full height drive is out of alignment. It can format disks and read them back, but can't read other disks, and it's disks won't read in other drives, so I need to realign that.